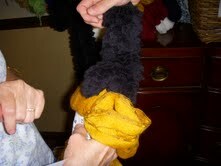 The last four days of July, 2011 was time to Yarn Crawl in the St. Louis area! Twelve shops in the region participated, opening with special hours, a free treat for every visitor (from cookies, to water, to mints, to brownies), a free pattern (usually knit), and special pricing on some yarns. This presented a wonderful opportunity to devote myself to visiting all twelve shops and see what I might have been missing. My good friend, Ronnie, acted as driver with me as navigator as we hit eleven of the twelve shops in one day! We arrived separately but at the same time at the last shop on our list at noon on Sunday. Several of the shops were ones we knew, including our LYS Hearthstone Knits and three others that we visit with some regularity. Following is a review of all twelve shops – in no particular order. I’m sure I’ll forget some key element(s) of each shop. So, don’t necessarily take my word for it. Most of these shops have an online presence, so please check them out for yourselves. Knitorious at 3268 Watson Road is now a mainstay of yarny goodiness in St. Louis. The shop is not conveniently located for me, so I don’t get there as often as I’d like. The shop has a huge inventory of yarns AND a nice little play area to divert the kiddies so that the adults can give more attention to petting all the yarns. This shop is where, last year, I found the perfect yarn for my daughter’s bridal shawl. The shop is more knit than crochet oriented, but there’s a lot here for everyone. They have good sale bins and a nice selection of hooks. 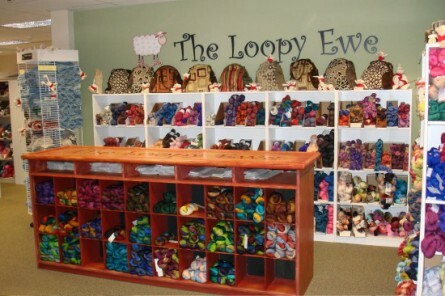 The Loopy Ewe, 2705 Dougherty Ferry Road, Suite 107, 63122 is the only shop I’ve seen located in an office building. At first blush, it’s a tiny space with a nice sitting area. Advancing a bit farther into the shop, I turned a corner and was met with shelf after shelf of yarn! This shop is only a couple miles from my home, but I had learned of its existence only a few weeks ago. 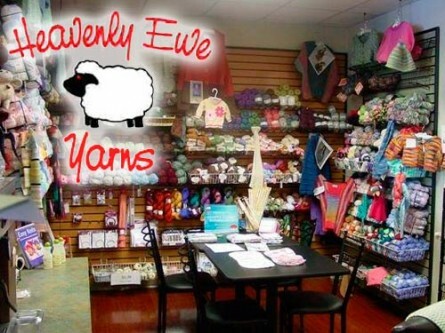 Sadly, the owners are moving to Fort Collins, Colorado, and will be transitioning to a predominantly online vendor of yarns. There is a huge selection of mostly high end yarns. They also stock a wide variety of Cascade Pima cotton in every imaginable color. Cascade is a workhorse yarn in all its varieties, so it’s nice to discover a place that stocks all their goods. Heavenly Ewe at 1716 Old Missouri Road in Arnold, Missouri is located inside a Christian Bookstore. This was a surprise to me. The yarn area is quite small, but contains very well-priced inventory. I found some Knitpicks Superwash Merino in 5 different colors that were priced at a ‘steal’. I grabbed two in a lavender mist colorway. The owner makes the best use of her tiny space. If you want Addi Hooks, this is the place for you (along with one other that will be reviewed later). Also, on her small table, was a WIP of a lovely crocheted baby dress and bonnet in apricot size 10 cotton. She couldn’t give us the pattern source, but I’ve seen it before and will track it down. I especially liked that crochet was featured rather than knit. Wool Gatherings at 510 N. West Ave (in the Wallach House) is another tiny yarn space tucked in an upstairs room of a large house, surrounded by antiques, collectibles, and some unique designer boutique clothing. Lots of distraction! But, yarn was what we were after, and yarn is what we petted. The shop is confined to a single room and has a small inventory. But, there were several very nice shop model projects to inspire and very friendly staff who are crochet friendly. 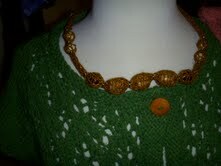 The simple, but lovely beaded necklace and the One Skein Ruffled Scarf were two outstanding displays. 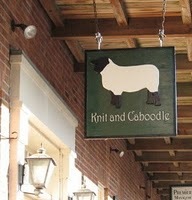 Knit and Caboodle at 330 S Main St. in historic St. Charles, MO is a charming shop I’ve visited several times. Christina Marie Potter teaches crochet at this shop. The inventory is large, including an entire wall of Cascade Wool. The sale shelves in the back of the shop offer great finds. There are two nice sitting areas tucked into the shop and a large classroom upstairs. St. Charles is on the Missouri River, site of the first Missouri State Capitol, sits on cobble-stoned streets teeming with shops of all kinds, from antiques to jewelry to ice cream to a great quilt store, Patches, and home to numerous restaurants from the respected Mother In Law’s Tongue to sports bars. Avoid driving on Main Street itself by heading for the casino on the river and parking in the lots that back up to the shops that face Main Street. A bit complicated, but worth the bother. PLEASE STAY TUNED FOR PART TWO OF THE REVIEW WHICH WILL APPEAR IN A COUPLE OF DAYS!